(Q) Which devices are compatible with Apple Pay? (Q) Where can I use Apple Pay? 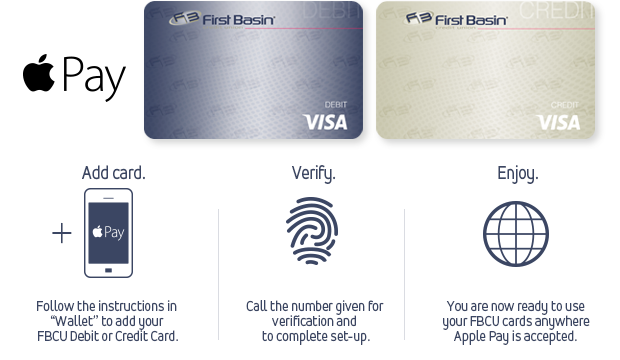 (A) You may now use your First Basin Credit or Debit card to make purchases from anywhere that accepts Apple Pay. It is now super easy and secure to pay in person or online all with the touch of a finger! Bam! Click here for a full list of Participating Businesses. (A) Yes! Apple Pay utilizes a number of security features to protect you. Apple Pay assigns, encrypts and securely stores a unique Device Account Number on your iPhone when you add a card. When you make a purchase, that number, along with a transaction-specific dynamic security code, is used to process your payment. Your card numbers are never shared with merchants or transmitted with payment and your name, card number and security code remain confidential because cashiers no longer need to see or handle your card. Plus, if your iPhone is ever lost or stolen, you can use Find My iPhone to quickly put your device in Lost Mode to suspend Apple Pay, or you can wipe your iPhone clean completely.